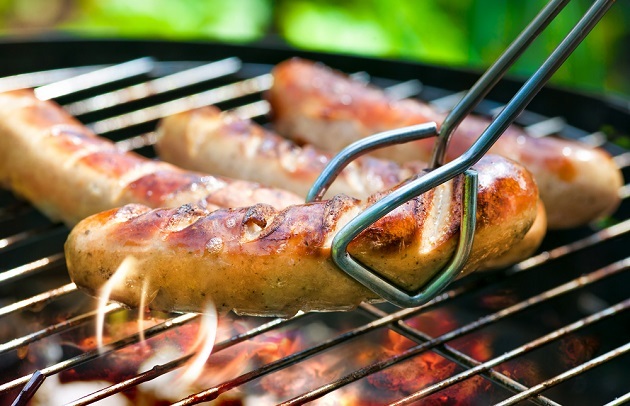 Whether you’re entertaining houseguests for a long weekend, hosting twenty of your closest friends for a cookout, or trying to stick to a family food budget, here are ideas for backyard barbecues that won’t break the bank or burn through your money. Invite the gang over for breakfast or brunch: Not every party has to start after 5 p.m. In fact, breakfast or brunch often works out better for everyone—especially families—as most of the afternoon and evening are free for other things. And it can be a relatively inexpensive meal for the host. Large eggs are ridiculously cheap and can be scrambled or fried on the grill, turned into smoke-roasted frittatas (think of crustless quiche), or baked into puffy Mile-High Pancakes. Serve with buttered and grilled bagels and a platter of grilled bacon—candied, if you’re feeling fancy—and breakfast sausages. Keep the liquor tab low with Smoky Marys or sparkling Grilled Sangria—always a hit at Barbecue University. Well-seasoned cast-iron skillets and a griddle would be big helps. Pizza party: Grilled pizza—as close as you can get to authentic pizza without a dedicated pizza oven—is a great excuse for a get-together and gives your guests the opportunity to get involved by selecting their own toppings. Make the dough from scratch from Steven’s recipe or buy dough by the pound from your local pizza parlor or supermarket (it’s usually with refrigerated foods). Then assemble an array of interesting toppings including meats, cheeses, raw and grilled vegetables, olives, jalapeños, etc. It’s a good idea to do a pizza practice run in advance of the party. To summarize the process, you’ll build a 2-zone fire. (Make sure the grill grate is thoroughly scraped and oiled.) You’ll drape the stretched dough on the hottest side of the grill, then move it to the cooler side of the grill until the bottom is nicely browned. Then you’ll flip it and cook the other (top) side. After moving the crust back to the cooler side of the grill, you’ll add the toppings starting with the cheese. (It sounds harder than it is.) Furnish a big green salad and plenty of beer and everyone will leave happy. Taco night: Inspired by frugal Mexican street food, some of the best on Planet Barbecue, we urge you to host taco night at su casa. (Tacos are thought to be named after the small paper-wrapped explosive charges 19th century Mexican silver miners used to expose silver veins.) Start off with cheesy bacon-wrapped jalapeño poppers and Smoked Mezcalinis. Wallet-friendly fillings for the tacos could include marinated and grilled chicken thighs, beef flap steak (often confused with hanger steak, but cheaper), squash and black beans, or our favorite—economical pork loin in a spicy chile marinade with fresh pineapple (Tacos al Pastor). Serve with Windy City Mexican Grilled Corn and one of the many salsas from this website or Steven’s latest book, Barbecue Sauces, Rubs, and Marinades. Dessert could be as simple as watermelon—grilled, of course. Go to the dark side: Chicken legs and thighs—called leg quarters when they’re attached—are one of the biggest bargains at the meat counter. They not only have more flavor than chicken breasts, but dark meat is less prone to drying out over the high, dry heat of the grill. Offer appetizers and side dishes: Serve a substantial starter such as grilled bread with toppings (bruschetta) or a variety of plate- and stomach-filling side dishes to take some of the pressure off the main course. Accept offers to “bring something:” Take some of the pressure off yourself as a host by saying “yes” to guests don’t want to arrive empty-handed. Maybe they have a specialty they enjoy sharing, or just like to be invested in the success of the party. Don’t waste fuel: If there is unspent charcoal in the firebox after a barbecue session, cover the grill and close down the vents. Use the rescued charcoal for the next grill session. Gas grillers, make sure you shut off the valve to the gas when you’re done cooking. Make friends with your butcher: He or she can give you a “heads-up” when your favorite cuts go on sale or steer you to off-cuts you may not have considered. That’s how I became acquainted with one of my favorite steaks, the shoulder petite tender. Read more about it here. Do you have any tips for saving money on barbecue? Please share them with us on Facebook, Twitter, and Instagram.